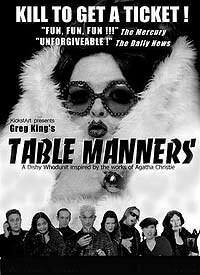 Table Manners is a flamboyant send-up of the classic murder mystery. It is the grand opening night of the Snowy Creek supper stage, and the dazzling Miss Dina Divine is discovered in her dressing room – dead! Assembled at the dinner table are six of her dearest friends, each with a damn good motive for murder! As the accusations fly and tempers flare, everything on the dinner table is put to delightfully inventive use to recreate the scene of the crime.